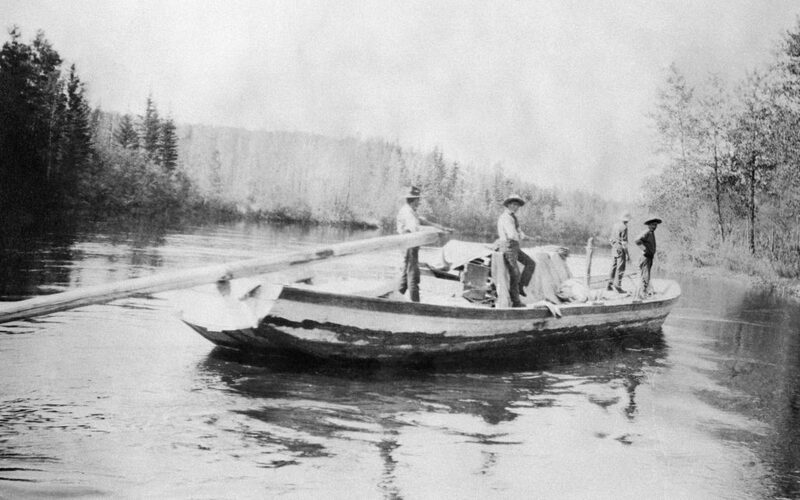 This is one of the sturgeon nosed boats used on the Athabasca River after 1835. This image, na-1338-20 is used with the permission of Glenbow Archives. The HBC men traveled through their territories in many different seasons, and in many different ways. Almost all came to North America via the London Ships: there were a few that already lived on this continent and who chose to join the fur trade. They traveled through their territory in both winter and summer: by snowshoe, by dog-sled in the winter-time, and by York Boat, birchbark canoe, or Athabasca River boat in the summertime. Most of their travel was done on the rivers, but on occasion they had a height of land to pass over on foot. These journeys will bring us from London to North America, and through North America by many different routes. Generally, we seem to be heading toward the Yukon and the Mackenzie River — but let us see where the stories will lead us. Follow me, and we will figure it all out.